It is very important to learn to write persuasively. Many standardized tests such as ACT and SAT include persuasive writing sections. Here is one way to set up a persuasive essay. Introduction: Explain the issue, state your opinion. Counter-argument: Explain what someone who disagrees with you might say. Explain why they are wrong. Support #1: Give a reason and examples. Describe why you believe in your opinion. Support #2: Give another reason and examples why you believe in your opinion. Conclusion: Summarize your argument. Extend it to the larger world. More advanced persuasive writing includes the elements of ethos, pathos, and logos. Should students be allowed to have cell phones in elementary and middle schools? 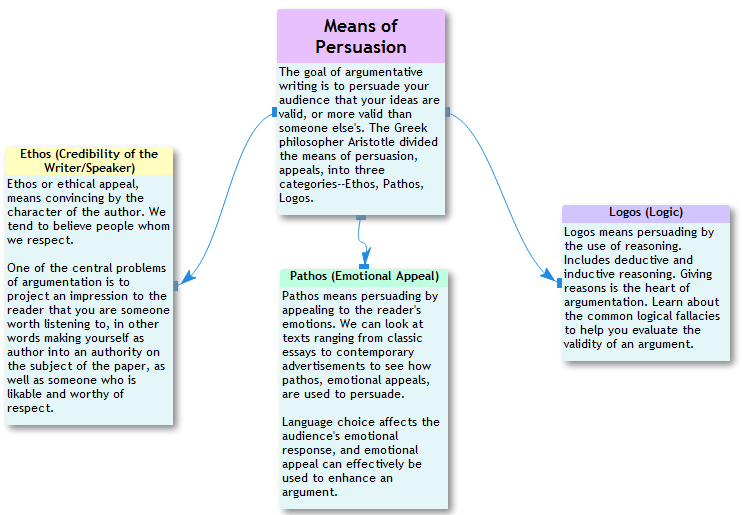 As homework, select another topic for persuasive writing, use MyndBook (MyndBook.com/go.php?to=306_1396) to create a note map of your ideas including the elements of ethos, pathos, and logos; and then write your essay.